WNCW spotlights the master of the avant-garde by exploring the musical diversity of Frank Zappa. Marshall Ballew was a guest DJ at WNCW for an hour on Friday, January 1, 2016. He played some favorite songs and talked about those artists, about what he has been up to since he left Spindale in 2001, his tenure at WNCW and much more. 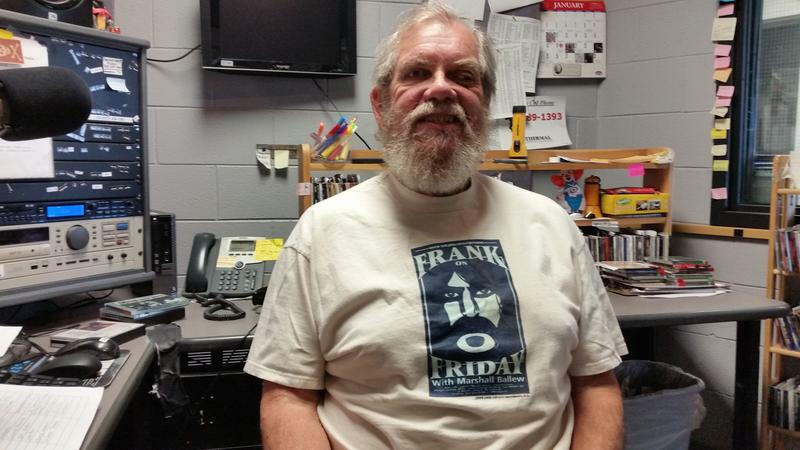 Marshall Ballew has rejoined WNCW as the host for Frank on Friday, which airs for an hour every Friday at noon. Thanks to everyone who participated in our recent survey on Frank On Friday; we had over 400 survey participants. It was good to get a feel for how many of our listeners and members perceived this unique program. My experience at WNCW tells me that there is very little middle ground when it comes to the music of Frank Zappa, and this survey reinforced that belief. Of the 172 comments received, only 11 expressed something like a neutral stance towards the show. Frank Zappa always seems to get a reaction, and a strong one at that! 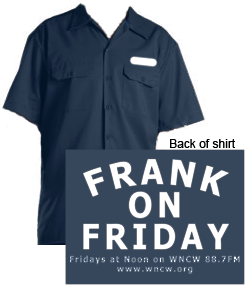 Get your customizable Frank On Friday work shirt. Write your name, or the name of your choice, on the front left side of your shirt. Click here to get your shirt now. 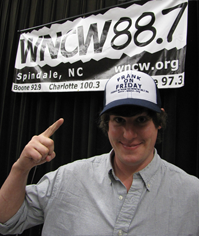 The Frank on Friday Ball Cap is brand new - click here to pledge now. Tune in on Friday for an opportunity to get a pair of tickets to Zappa Plays Zappa on Tuesday, February 5th at the Neighborhood Theatre.